The Emerald Ash Borer is an invasive insect that was first identified in the United States in Detroit around 2002. The insect is a small emeraldy green beetle, approximately 1/2 an inch in length. This pest is devastating the ash tree population in the eastern and midwestern United States, and has already killed several hundred million ash trees. The insect was found in Philadelphia (Pennypack Park in 2016) and will wipe out all of the city’s ash trees over the course of the next five to ten years. Dead ash trees can be very brittle, and are dangerous and difficult to remove. If you own an ash tree you should act now to either remove it or to protect it. This problem will not go away and the longer you wait the more it will cost. 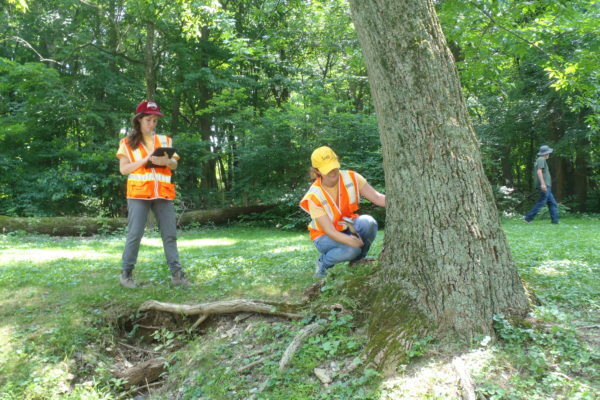 This page will help you identify if you have an ash tree on your property and help you determine what the next steps are to either treat or remove the tree to prevent future hazards and costs. Colorado State University recently developed an app to help you identify Ash trees, and therefore identify whether a tree is susceptible to the Emerald Ash Borer. Download this amazing app today! Never transport firewood from ash trees, as this has been responsible for the rapid spread of the insect. 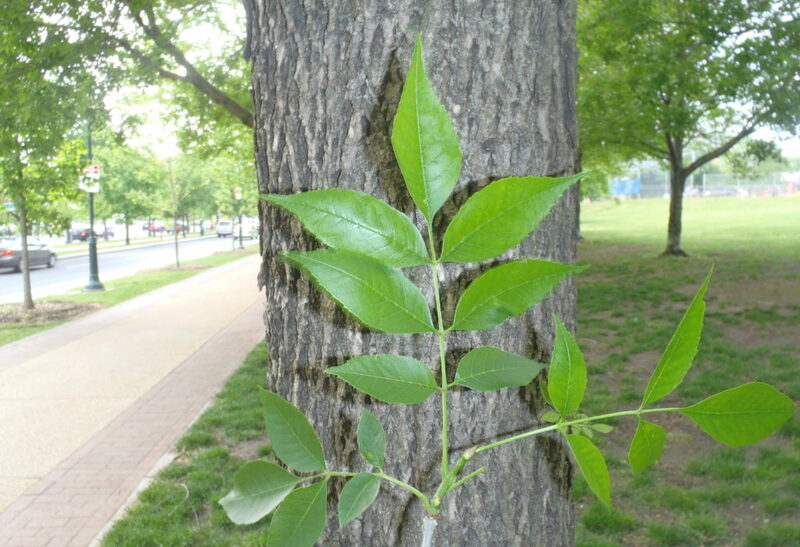 There are two strategies for managing your ash tree. If the tree is healthy, and a valuable part of your landscape, with no major defects, it can be treated with an insecticide to suppress EAB. An excellent resource on insecticide treatment can be found here. If the tree is already unhealthy, or has defects or damage, and is not a valuable part of your landscape you should have it removed. Remember, it is safer (for you and your arborist) and less expensive to remove the tree before it dies. 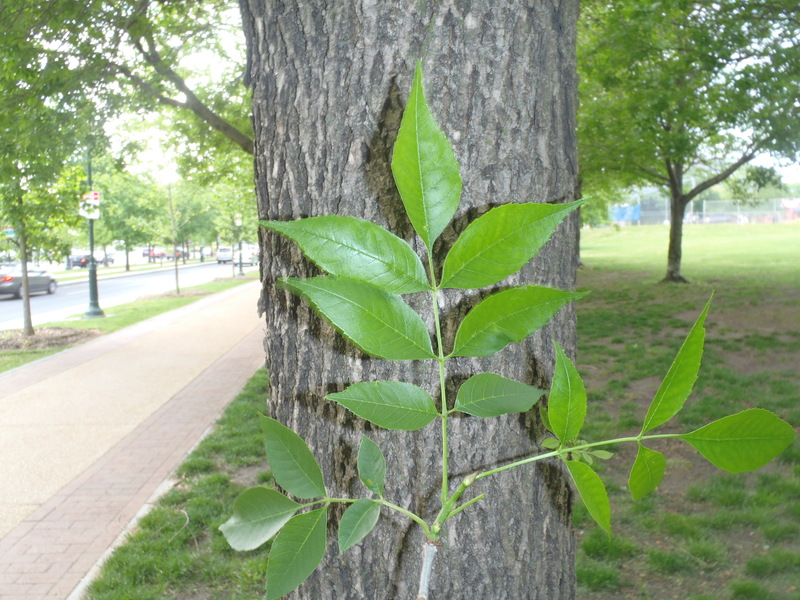 Because EAB has been found in Philadelphia and surrounding counties, now is the time to act. If you wait to see if your tree is infested it will be too late. All untreated ash trees are going to be killed. We recommend that you replant a new tree in your yard to replace your lost tree. Trees increase property values and improve your quality of life. Some good choices we recommend for your yard are red oak, willow oak, white oak, swamp white oak, southern red oak, scarlet oak, sugar maple, black gum, American beech, tulip poplar, and white pine. The City of Philadelphia’s Emerald Ash Borer Management Plan was developed in 2012, well before the Emerald Ash Borer was found in Philadelphia County. When the Emerald Ash Borer was identified in Pennsylvania, Philadelphia Parks & Recreation’s Urban Forestry and Ecosystem Management division knew it was only a matter of time before it spread to Philadelphia. 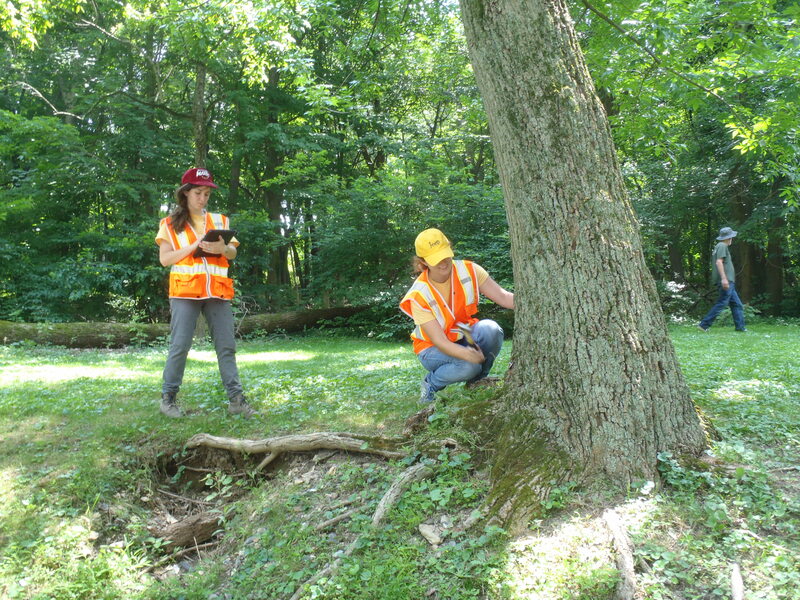 The initial task in the management plan was to inventory trees that are or could become hazardous if killed by EAB. 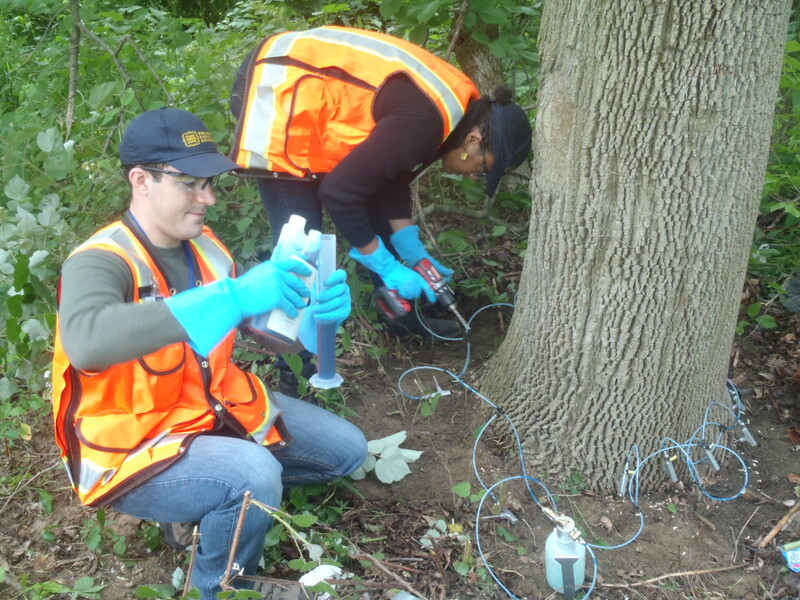 Most potential hazard ash trees were documented and tagged for removal or for treatment to suppress EAB. Since treatment of ash trees is costly and generally only lasts for one to three years, depending on the insecticide used, only select “high priority” trees or groups of trees were selected for treatment. 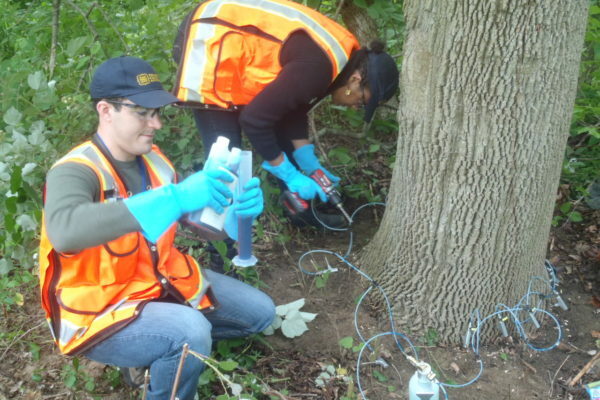 In 2015, Philadelphia Parks & Recreation received a grant from PA’s Department of Conservation and Natural Resources (DCNR) to purchase pesticide to suppress EAB. During the summers of 2015/2016 the EAB Suppression Team treated approximately 1,500 selected ash trees throughout the City park system and along our streets. Treated trees will be re-treated every two/three years as long as the pest is present, which it is for the foreseeable future. PPR staff arborists and subcontractors have also preemptively removed an additional 400+ ash trees that were deemed not suitable for treatment. There are no natural predators that have been found to reduce or slow the onslaught of this pest. It is expected that all of the ash trees within our park woodlands, along our streets and within residential properties will be killed within the next 5-10 years. A recent inventory conducted by the US Forest Service documented that more than 200,000 of Philadelphia’s 3.1 million trees are ashes, including 600 street trees. This video explains the signs and symptoms of the Emerald Ash Borer. This video from 2011 was made by the Great Lakes Restoration Initiative in partnership with the National Park Service. It shows the importance of Ash trees and the grave impact of the Emerald Ash Borer. This video is a hilarious and informative piece made by the Denver Botanical Garden.